What Do Microcurrent Facials Do For The Skin? What Is Microcurrent Facial Treatment? How Do The Microcurrent Facials Work? What Are The Benefits Of A Microcurrent Facial? The microcurrent facial is a therapeutic treatment that delivers safe, painless, low-level electrical impulses to strategic locations under the skin to firm and tone the facial muscles on both an immediate and long-term basis. The technology simultaneously repairs collagen in the dermis (the deepest layer of the skin), while gently erasing signs of aging in the epidermis (the top layer of skin). As we age, our electrical impulses slow down causing aging and sagging facial skin. Microcurrent technology works in harmony with the natural bio-electrical currents naturally found in our bodies to help speed up the cellular regenerative process resulting in firmer, healthier, more youthful looking skin. In 1980, Thomas W. Wing. D.C., N.D., LAc., a fifth generation Chinese Doctor is credited with introducing a microcurrent device which was found to be beneficial in the treatment of muscles. Originally approved by the FDA as a muscle stimulator, it also found new life in the Cosmetology industry for cellular rejuvenation, facial toning and wrinkle reduction. Microcurrent facial devices are used to help re-educate the underlying muscles, giving better tone to the face. The result is a firmer facial tone, diminished lines and overall improvement in texture. At one time, microcurrent facial treatment was exclusively offered through day/medical spas, dermatologists and plastic surgeons offices. Harnessing the benefits of the same professional strength technology, several very effective microcurrent facial devices for home treatment have recently emerged such as NuFACE®'s Microcurrent Facial Toning Systems. Based on the successful principles of the Micro-Dermal Tone Technique, NuFACE is the only hand-held microcurrent facial device approved by the FDA for home facial toning treatment. 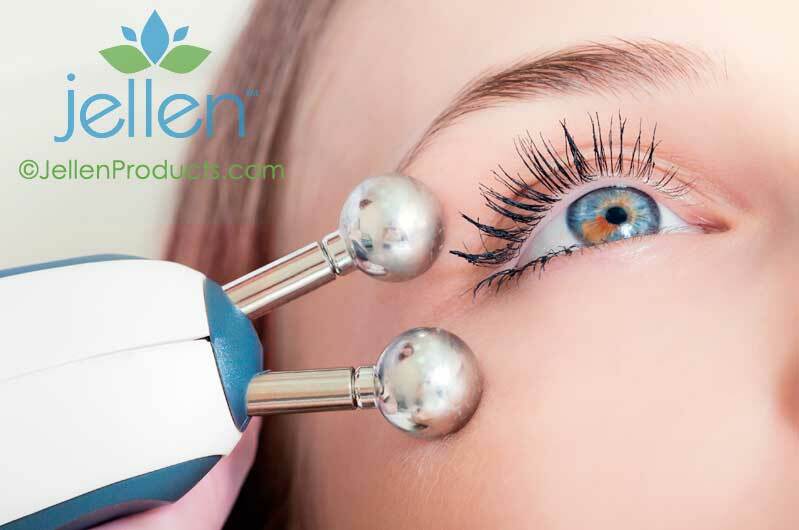 It produces a low level of alternating electrical current emitted through dual spherical probes in which the user glides along the contour of the face. NuFACE Trinity is the newest edition in NuFACE's line of home microcurrent facial systems. It offers the same microcurrent technology treatment as the NuFACE Classic system in addition to the ability to purchase additional interachangeable treatment heads such as the NuFACE Trinity Wrinkle Remover - an optional photofacial light therapy attachment that can be purchased separately. The Trinity also offers the benefit of a charging cradle whereas the NuFACE Classic device takes batteries. Both systems are excellent and produce measurable results. Portable microcurrent facial devices such as NuFACE not only allow the convenience and privacy of in home treatment, but also saves those seeking spa-quality microcurrent facials, the time and expense involved in visiting a spa or salon. Considering that the average cost of ONE professional microcurrent facial toning treatment can run around $150 with a series of sessions recommend several times a year, the above devices will pay for themselves after only a few treatments. Remember: "True" microcurrent uses less than 500 microamperes (Ua). Only true, quality, professional-grade microcurrent facial toning devices such as NuFace® use up to 500 microamps for optimal effectiveness and should never cause an actual "visual" contraction of the facial muscle. How Does The Microcurrent Facial Work? The microcurrent facial involves the application of low-level, waveform-shaped electrical impulses through dual tipped probes in combination with a water-based conductive gel. When applied to the skin, the gentle electrical current rehabilitates the underlying muscles and improves circulation, texture, tone, and fine lines. Regular use of microcurrent will continue to provide muscle strength and restore freshness to the appearance. The technology works internally on the muscle fiber and tissue for visible, external results – it's like taking your face to the gym! Microcurrent used for the purpose of skin rejuvenation differs from Electro-Muscle Stimulation (E.M.S.) which is a medical procedure utilizing a very strong current to force repeated muscular contraction and expansion. Microcurrent facials deliver a variety of benefits to patients who wish to maintain a more youthful looking appearance and is an extremely safe and gentle non-invasive alternative to dramatic plastic surgery procedures, laser resurfacing, chemical peels, Collagen and Botox injections and other invasive treatments. The results can vary by individual and skin type, are gradual, and will not just "happen" over night. Although microcurrent facials are know known to produce an immediate and temporary rejuvenating effect, continued daily application will provide more cumulative long-term, lasting results! Copyright © 2005-2019 Jellen Products, Inc. All Rights Reserved.